Star Trek takes its first stab at the concepts of parallel universes and other dimensions in this obscure, bizarre episode. “The Alternative Factor” is an episode of Star Trek that I never watched until more recent years, and it is an unusual entry in the canon that I’ve rarely seen discussed by fans and critics alike. 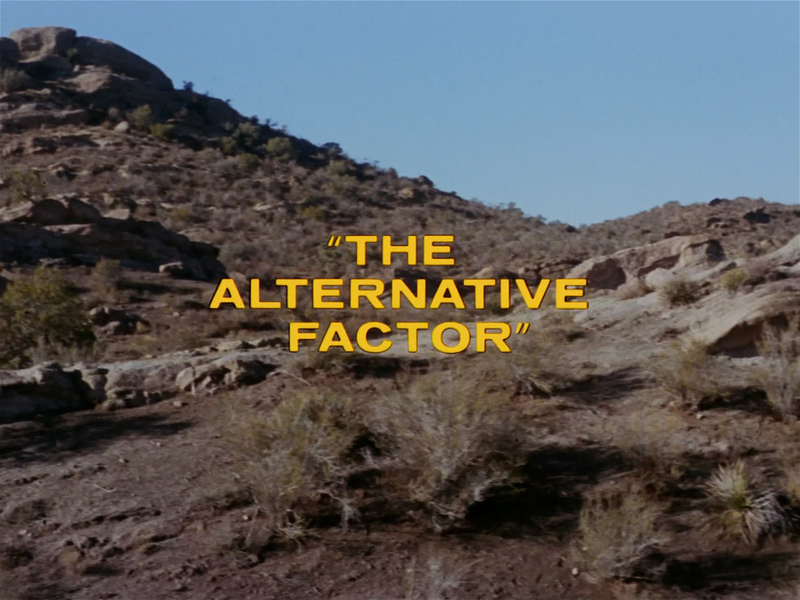 Like some of the earliest episodes at the beginning of the season, “The Alternative Factor” feels more like The Twilight Zone or Doctor Who, rather than the Trek we are used to. The Enterprise is on a routine mapping assignment above a deserted planet, one that is nearly as arid as Mars but still has an Earth-type atmosphere. All is normal until the ship experiences an incredible force of distortion, attributed to what Spock describes as a “cosmic winking-out,” essentially, a brief cessation of all magnetic and gravitational forces in the area. For a few moments, gravity, magnetism, and radiation cease to exist as we understand it. This startlingly devastating effect is the strongest at the planet Enterprise is orbiting, but it is still felt to varying degrees throughout the rest of the quadrant, which puts Starfleet on the alert. Captain Kirk is given the unenviable task of investigating this phenomenon on his own, while Starfleet begins evacuating ships and personnel from nearby systems. What he and the landing party discover on the surface of the planet, is a small spacecraft, and one apparently human lifeform, who only appeared after the “winking-out” phenomenon. Any fan of The Jetsons will probably look at this tiny spacecraft and laugh, as it bears an almost uncanny resemblance to George Jetson’s iconic mode of transportation. Adding to the zaniness of the situation is the discovery of a man named Lazarus, a seemingly crazy humanoid who talks about being attacked by some kind of monster. 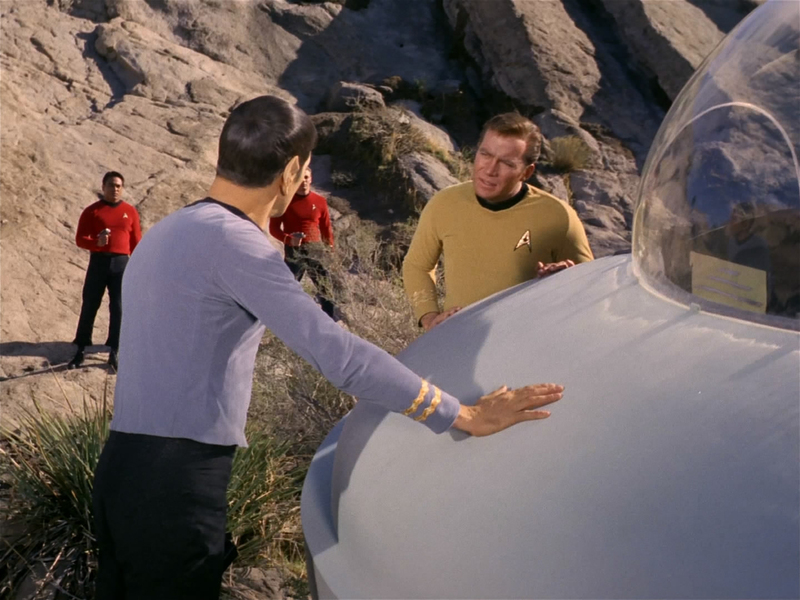 Moments after meeting Kirk and crew, Lazarus is thrown into a kind of spatial warp, and is seen fighting with another person who looks just like him. This scene, and subsequent ones like it, is shot with some sort of negative filter, which might have been neat, except that the loopy zooming in and out of the camera is very distracting, and the spinning-screen effect that cuts in and out of these fight scenes is so much like Adam West-era Batman that it is hard not to laugh at. “The Alternative Factor,” like its subject of interest, Lazarus, waffles between the intelligent and thoughtful, to the quirky and bizarre. Unbeknownst at first to the Enterprise crew, Lazarus is actually two almost identical men, one from our universe, and another from a parallel universe. One is calm, rational, the other, crazed and manic. They transpose positions at random intervals, and when this transposition takes place, they briefly do battle with one another in some sort of nexus (referred to at least once as a negative energy corridor) between the two universes. It is a fascinating concept, but this idea is handled so sloppily, and it takes so long for the story and the characters to arrive at its major selling point, that it all just falls flat. Intelligent, thought-provoking investigative dialogue between Kirk and Spock about the problems being faced, are undercut by lots of wasted time following the alternating Lazaruses (if I may bend the rules of English and pluralize a proper name) around the ship. There is a lot of double talk from Lazarus; references to “the thing,” the monster,” his “holy quest,” and vague dialogue about how the Enterprise’s dilithium crystals might be the key to solving the crisis. In the middle of all of this is the worst Enterprise security since “Mudd’s Women.” Lazarus is allowed to just traipse around the ship, as if he is just another passenger. He even hangs around in the mess hall, bandaged, bloodied, his clothes torn and dirty, and everyone looks at him like he is one of the crew. On two separate occasions he was confined in Sickbay, and neither time was a security guard present. And naturally, no security is around while Lazarus casually sabotages Engineering, steals several dilithium crystals, and then beams down to his own ship. If I had popcorn to throw at my TV, this is when I would have tossed it. What almost but not quite saves this episode, is when Kirk accidentally crosses over into the “anti” universe, and once confronted by the Captain in his home plane of existence, the rational version of Lazarus (the anti-Lazarus) finally stops being cryptic. He at last gives Kirk the truth, and explains his plan to trap his insane counterpart. Apparently, the crazed version of Lazarus, driven mad by the realization that he has a duplicate, plans to cross over into the “anti” universe at the same time as his opponent, which will not only destroy both of them, but will annihilate both universes as well. This scene benefits from an appropriately alien, eerie atmosphere, and it feels very much like a moment from The Twilight Zone. The other universe is described as one that is just like ours, except all matter in that universe is actually anti-matter. Now, if that were true, and if it is also true that matter and anti-matter, when brought into contact, violently cancel each other out, it would seem that the cosmic jumping around that both Lazaruses have been doing, would already have destroyed both universes. Along those lines, I would think that Kirk’s presence in the anti-universe would be disastrous. Perhaps the “winking-out” was in fact that very destruction taking place, albeit not long enough to be permanent. It seems to me, that a more reasonable explanation of what is taking place in this episode, is something more like what Doc Brown describes in Back to the Future: Part II: that is, when two identical beings from alternate timelines (or realities, in this case) meet in the same point in time and space, that a destructive chain reaction can take place which unravels the space-time continuum. I can’t be exact in my examining of the science behind this episode, since many of the ideas surrounding the relationship between matter and anti-matter, alternate realities, and the plausibility of time travel, are still theoretical. We do know that encounters between particles and anti-particles cancel each other out with mutual annihilation, but there is still much we do not know about anti-matter and anti-particles. Also, though I am an appreciator and admirer of modern sciences and physics, I am by no means an expert in those aforementioned fields. What I can be exact in, is my opinion and critique of the episode itself, as a piece of entertainment. And in that respect, I have to say that “The Alternative Factor” is pretty weak. I am not sure if this, or “Mudd’s Women” would qualify as worst episode of the season. “Mudd’s Women” at least has a certain charm and entertainment value in its cheesiness, and tried to be socially relevant even if the delivery of the message was extremely clunky. “The Alternative Factor” tries to explore intelligent ideas, and there are a few scenes which are genuinely thought-provoking and engaging. 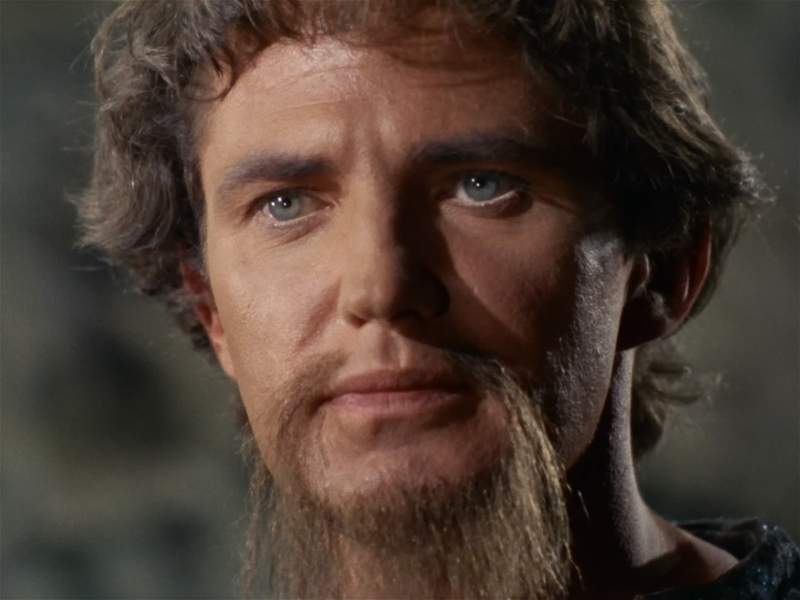 I must also give some props to the ending, which chooses to send the story off on a somber note: The final dialogue has Kirk pondering the fate of Lazarus; two versions of one man, damned for all eternity to fight each other in a nexus between two universes. Their lives and their sanity are sacrificed, in order to save all life as we know it. It’s certainly an interesting and disquieting concept to ponder, it’s just too bad that the bulk of the episode is so sloppy, plodding, or at times outright laughable. I can’t with any sincerity, recommend a viewing of this episode, except to those who want to watch The Original Series in its entirety, or to anyone obsessed with stories about parallel dimensions and alternate realities.